I felt good enough to buy their plumbing and HVAC yearly contract. As the Top Rated Local® HVAC company serving Raleigh and Rocky Mount, NC. Your Service Professional provides the best heating and cooling, air quality, and plumbing services you’ll find in the phone book. Skip the hassle of searching online for the best HVAC contractor in your area. Work with the experts your neighbors already know and trust. 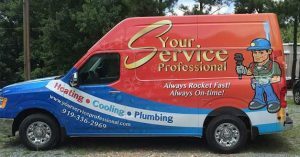 Your Service Professional has been the preferred heating, air conditioning, air quality, and plumbing team in Raleigh since 2002. We continue to serve the local community with exceptional HVAC services today. We are here for you with 24/7 emergency air conditioning repair, heating repair, and air quality solutions, and you can always expect prompt same-day or next-day service. Call us at 919-251-5374 if you are ready to get started! Are you struggling to keep your HVAC system, air quality, humidity levels, or plumbing under control but can’t seem to find a technician you can trust? We know what it’s like to call for an HVAC service, only to realize the technician never meant to show up. In fact, many residents and businesses in Raleigh and Rocky Mount choose Your Service Professional due to our reputation of providing prompt, reliable, and excellent service every single time. If you are tired of service professionals making promises they don’t keep. It’s time to look for a team of experts who are customer-oriented and always have your best interests in mind. Read on to learn more about Your Service Professional and find out how we quickly became the Top Rated Local® heating, AC, and plumbing experts in Raleigh, NC and the surrounding Research Triangle area. Have you ever worked with a technician who was more concerned about getting to the next job? That it felt like they were rushing through your project? And then you receive the invoice, and you can’t believe what they are charging you? We know the feeling. That’s why we created Your Service Professional — to shift the focus of Raleigh HVAC services back onto the best interests of the customer. For us, it’s all about serving you, solving the problem, and ensuring your long-term comfort with an HVAC system that runs properly during all times of the year. At Your Service Professional, each and every one of our HVAC technicians are passionate about helping customers enjoy lasting comfort in their home or workplace. Our mission is to put the needs of our customers first, whether that means driving through the rain to provide heater repair services in the middle of winter or doing an air conditioner installation on a 100-degree day. From making sure you receive a detailed explanation of the work we’re about to do to cleaning up after the work is done to save you time, our specialists go the extra mile to deliver exceptional HVAC services. Our work is not done until we see a smile on your face! There is no one-solution-fits-all approach when it comes to installing or repairing furnaces and heaters, AC units, humidifiers and dehumidifiers, air purifiers, and plumbing systems. It all depends on the age of your HVAC system, whether or not it was installed correctly in the first place, the actual problem at hand, your budget, and many other factors. When you choose Your Service Professional as your trusted HVAC contractor, we tap into our industry knowledge and years of experience to meet all of your needs as best we can, which is why we recommend solutions that take into account your specific situation and budget. Our goal is to get to the root of the problem and ensure that it does not reoccur or give you any additional hassle. As a result, you can expect to receive long-term HVAC solutions that guarantee true peace of mind for years to come. Your Service Professional is not just here to make a profit. We are in it to build long-term relationships with our customers through exceptional HVAC services and genuine care for home and business owners in Raleigh and Rocky Mount. How we see it is that we are helping out our own neighbors, so why would we provide anything less than great service to the people in our own community? Our no-hassle HVAC services are personalized to fit your needs and budget, so don’t settle for just any HVAC contractor that pops up when you search “AC repair near me.” Instead, work with a family-owned and operated company based right here in Raleigh, NC that has a team of skilled heating and cooling experts who respect your time and are passionate about delivering service with great value. Feel free to contact us today or visit our Facebook page for more information. The heater wasn't working properly at my elderly mother's house, and I live out of state, so I called Your Service Professional. The lady who answered the phone was very nice, so my first impression was great. My mother doesn't hear well and consequently doesn't understand things sometimes, so I had the technician call me when he was on his way to Mom's house and I had him call me with a run-down of her system's issues after he checked it out. Martin was professional, knowledgeable, patient and kind. And the bottom line...Mom's heat is working and she is very happy! I took a chance from Nebraska and chose a winner! My mother and I would recommend these folks to anyone! He was on time. I requested a call to let me know he was on the way which he did. He was polite and respectful. He let me know what needed to be done did the work and left everything neat and clean. I would definitely use the again. I have used Your Service Professional for over five years through a couple of name changes for the business. Regardless of the name the Heating and Air Conditioning service has been prompt, professional and completed in excellence. I have recommended Your Service Professional to friends and they too have echoed my sentiments that the service is First Class. "Thank you so much for your service! As usual, your technician (Abi) was very courteous and polite. Had everything done with no delays nor problems. Everything is working great!" Copyright 2018 by Your Professional Services. Made with .